Background/Purpose: Dermatomyositis (DM) is an idiopathic inflammatory myopathy that primarily affects the muscle and skin. In refractory disease, it is common to fail 2 or more steroid sparing agents or high dose steroids. This open-label, 12-week proof-of-concept study was conducted to evaluate the efficacy and safety of tofacitinib, a JAK inhibitor, in active, treatment refractory DM. Methods: 10 subjects were enrolled at one center. Tofacitinib was given as 11mg XR daily. Subjects were washed out of any steroid sparing agent and not allowed more than 20 mg of prednisone daily prior to study entry. The primary outcome was the proportion of subjects meeting the definition of improvement (DOI) at 12 weeks, defined by the International Myositis Assessment and Clinical Studies (IMACS) as improvement of ≥ 20% in 3 of 6 core set measures (CSM) with no more than 2 worsening by ≥ 25% [(which cannot include the manual muscle testing (MMT)]. The secondary outcome measures were the Cutaneous Dermatomyositis Disease Area and Severity Index (CDASI), steroid-sparing effect of tofacitinib, safety, and tolerability. Results: 9 subjects were analyzed because the last subject has not yet completed the study. All subjects failed at least 2 steroid sparing agents or high dose steroids. All 9 subjects met the primary outcome DOI at 12 weeks, with 5 of 9 (56%) demonstrating moderate improvement and 4 of 9 (44.4%) having minimal improvement based on the Total Improvement Score (TIS) of the Myositis Response Criteria. The median TIS was 40 [IQR 32.5, 47.5] indicative of at least moderate improvement. 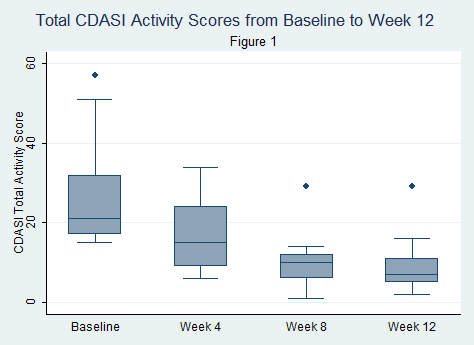 The secondary outcome of the mean change in CDASI activity score from baseline to 12 weeks was statistically significant (28 ± 15.4 (baseline) vs. 9.5 ± 8.5 (12 weeks), p=0.0005) with clear trend in improvement (Figure 1). 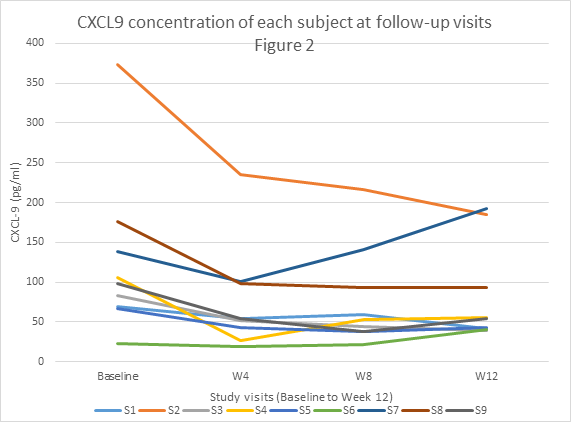 Chemokine data on CXCL-9/10 also showed a trend toward improvement with treatment but did not show a statistically significant change from baseline (CXCL9, p=0.09; CXCL10, p=0.06) (Figure 2). Myositis autoantibody titers did not show any change in titer after treatment. Six subjects were positive for anti-TIF-1 gamma and 5 of 6 (83%) were moderate responders. Four of 9 (44.4%) were on prednisone 20mg/daily at entry and 3 of 4 (75%) were able to completely taper off all steroids. Tofacitinib was well tolerated without any serious adverse events. Conclusion: Tofacitinib demonstrated evidence of strong clinical efficacy as measured by a validated myositis response criteria with a corresponding decrease in chemokine levels. A randomized controlled trial should be considered to further assess efficacy in dermatomyositis. Disclosure: J. J. Paik, None; J. Albayda, None; E. Tiniakou, None; A. Koenig, Pfizer Inc, 1,Pfizer Inc, 3; L. Christopher-Stine, Inova Diagnostics, 7. Paik JJ, Albayda J, Tiniakou E, Koenig A, Christopher-Stine L. Study of Tofacitinib in Refractory Dermatomyositis (STIR): An Open Label Pilot Study in Refractory Dermatomyositis [abstract]. Arthritis Rheumatol. 2018; 70 (suppl 10). 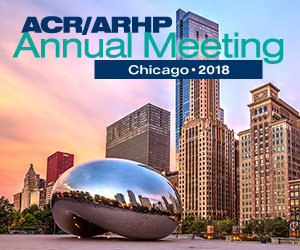 https://acrabstracts.org/abstract/study-of-tofacitinib-in-refractory-dermatomyositis-stir-an-open-label-pilot-study-in-refractory-dermatomyositis/. Accessed April 20, 2019.